The Red Sox and Cardinals will be meeting for the fourth time in the World Series, all since 1946. Only Yankees-Dodgers (11), Yankees-Giants (7) and Yankees-Cardinals (5) have been more common World Series opponents. Yankees-Braves, A’s-Giants and Tigers-Cubs have also had four World Series matchups. The Cardinals went the seven-game limit to beat the Red Sox in 1946 and 1967. And in 2004, Boston ended a legendary 86-year title drought in emphatic fashion, sweeping St. Louis in four straight. While the Red Sox easily copped the American League pennant, St. Louis and the Brooklyn Dodgers wound up t ied for first place in the National League. The Cards then swept the Dodgers in a best-of-three playoff to advance to the World Series for the fourth time in five years. The Red Sox, in the post-season for the first time in 28 years, won the opener in St. Louis on a 10th inning home run by Rudy York. The teams alternated wins over the next four games, and the Series headed west to St. Louis with Boston up 3-2, needing just one win for the championship. They didn’t get it. Southpaw Harry “The Cat” Breechen stopped the Red Sox 4-1 in Game 6, setting up a winner-take-all finale. 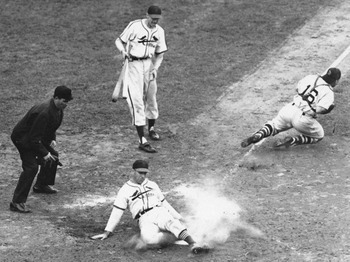 Trailing 3-1 in the eighth inning of Game 7, Boston’s Dom DiMaggio doubled in a pair of runs to tie the score, but injured his leg and had to leave the game. He was replaced by Leon Culberson in center field. St. Louis outfielder Enos Slaughter, above, led off the bottom of the eighth with a single and then scored all the way from first with two outs in what was generously ruled a double by Harry “The Hat” Walker. Red Sox shortstop Johnny Pesky was slow getting the relay home, and his delay helped give the Cardinals a 4-3 lead. The loss of DiMaggio in center (an excellent fielder as befits his name) also contributed to the play. The first two Boston batters singled in the night but Breechen, pitching in relief on just one day’s rest, was able to get the next three outs to earn his third win of the World Series. Breechen pitched two complete games and allowed the Red Sox just one run. It was the only post-season matchup for two all-time greats, Stan Musial of the Cardinals and Boston’s Ted Williams. Musial hit just .222 in the Series, while Williams was held to a .200 batting average. It was the year of the “Impossible Dream” in New England. The Red Sox, who finished ninth the previous year, held off the Tigers, Twins and White Sox in a taut, four-team AL pennant race that wasn’t decided until the final day of the season. Cardinals right-hander Bob Gibson, right, was at this dominant best in this Series with three complete game victories and a World Series MVP. Gibson won Game 1, 2-1, with 10 strikeouts and followed that up with a 6-0 shutout in Game 4 that gave St. Louis a 3-1 lead. The Red Sox rallied to win Games 5 and 6 and force a dream seventh game showdown between Gibson and Boston’s ace Jim Lonborg. And once again Gibson prevailed, hurling a three-hitter, striking out 10, and even hitting a home run in a 7-2 Cardinals win. Lonborg, pitching on just two days rest, simply ran out of gas. He had pitched a complete game win against Minnesota on the last day of the regular season to lead Boston to the AL pennant. Then in the World Series he won Game 2, 5-0, with a one-hitter — retiring the first 22 batters he faced — and Game 5, 3-1, with a three-hitter. Lou Brock led the Cardinals attack with seven stolen bases and a .414 batting average, while Roger Maris hit .385 with a Series-leading seven RBIs. Carl Yastrzemski, who won the AL Triple Crown, hit .400 with three home runs for Boston. The R ed Sox broke the 86-year-old Curse of the Bambino, sweeping the Cardinals to win their first World Series since 1918. Boston won the AL pennant by rallying from a 3-0 deficit to beat their nemesis, the New York Yankees, in the ALCS. The Cardinals, who won a major league high 105 games in the regular season, stopped the Houston Astros in seven games in the NLCS. Boston was making its first World Series appearance since 1986; St. Louis since 1987. After winning an 11-9 slugfest in the opener Red Sox pitchers allowed only three runs in the final three games — starts by Curt Schilling, Pedro Martinez and Derek Lowe in the clincher. Boston outfielder Manny Ramirez batted .412 with a home run and four RBIs to win World Series MVP honors. Larry Walker hit .357 and hit the only two home runs the Cardinals managed. Eli Manning knows it. So do the Giants. Something stinks in New York. The Giants have been around for 88 years, just like my father. But less than two years after their thrilling Super Bowl triumph over the Patriots, the Giants are on the way to their worst season ever. For the first time under Tom Coughlin and just the third time in their history, the Giants are 0-5. Throw out the 1987 start, when they used replacement players during a labor lockout, and the Giants last began 0-5 in 1979. That year, they lost twice to the Eagles, and also fell to the Cardinals, Redskins and Saints under Archie Manning. Then a rookie rookie quarterback named Phil Simms took over and led them to four straight wins and a 6-10 final record. The other 0-5 start — go back to 1976, the first year in Giants Stadium, when New York lost its’ first nine games en route to a 3-11 mark. Today’s Giants don’t play defense. The last team to allow five straight opponents to score 30 or more points to start the season was the 1954 Chicago Cardinals. No Giants team has ever given up 182 points in five games to start the year. Check. Check. The offense has been just as futile. The 38-0 defeat at the hands of the Panthers in week 2 was the Giants worst shutout loss in 40 years, when the Raiders, behind quarterbacks Ken Stabler and Darryl Lamonica and an ageless kicker named George Blanda, beat New York 42-0. These teams may soon have company. Look on the bright side, Giants fans. Sundays are opening up. Join the Jadeveon Clowney sweepstakes, win valuable prizes. PS — In case you’re wondering, the worst shutout loss in Giants history — 45-0 to the Eagles in 1948. And the biggest losing margin — 56 points, a 63-7 embarrassment to the Steelers in 1952. How about an all-LA Super Bowl?